I'm Christie and I get to marry my best friend on April 29, 2012. I grew up here on the east coast. Damon grew up in Albuquerque and joined the US Navy when he was 19. 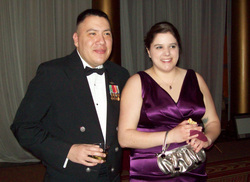 His time in the navy has taken him all over the world but in the summer of 2008, he was stationed in DC. 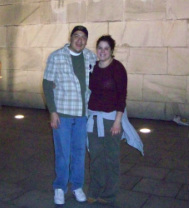 Looking to meet new people in the area, he signed up for an online dating site. This is where I come in. We "clicked" online and decided to meet in person for lunch, and what turned out to be a 12 hour date. I knew instantly that I had met my best friend. He was so easy to talk to and we balanced each other well. In fact, we hit it off so well that we moved in together after our third date. The rest, as they say, is history. Flash forward two and a half years. The proposal was about as much of a surprise as it could be considering my mom gave us her ring, which we took to a jeweler together and had the setting redesigned and added stones, but it was sweet nonetheless. We spent the morning working in our vegetable garden and decided to break for lunch. Afterwards, he kept trying to get me to go back out to the garden, but I like a good nap. Apparently, he had buried the ring box in the soil for me to dig up but I was cranky, so I got a sweet proposal during a naptime cuddle instead.